A newest member of the Little Bigfoot gang, LBF Kitty! The one that stands is about 10 inches tall. It is designed the exact same way all the other LBF animals are designed, in a permanent standing position with a basic stuffed face and yarn eyes. The sitting ones are about 6 inches when sitting and about 9-10 inches all stretched out. Although the written pattern is the exact same, they have eye indents and cheeks. It may look difficult but it's easy to do. I have included lots of photos and instructions to get you through those parts. There is no video tutorial yet. The written pattern below is for both the standing kitty and the sitting kitty. Get the rest of the animal patterns in this series here. Of course you can use any yarn brand of your choice, just be sure to choose the appropriate hook size. Eyes: you can use buttons, felt, paint, safety eyes or crochet them. It's up to you. The blue eyes used in this pattern are 10mm. EYES: IMPORTANT: For those of you making the indents and cheeks, cut 2 strands of yarn, each about 2 feet long, the same color as the head. Set them aside until further instruction given at the end of row 15. There is a separate page of instructions for the indents and cheeks, links given in the pattern. *Now is the time to put in the safety eyes if you're using them. a) If you have chosen to NOT make the indents then the eyes go in between the 10th and 11th row with about 7 or 8 stitch holes between them. 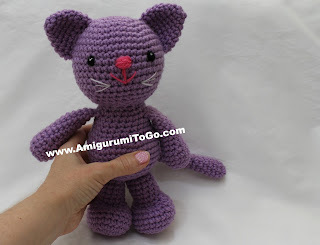 b) If you want to just wrap black yarn as shown on the purple kitty, you can do that after the doll is stuffed and closed. ( assembly page, see step 7). c) If you want to make the indents and cheeks, please go to the instruction page here, see step 1. Install the eyes and strings then come back here and carry on. *Stuff majority of head. Make sure to gt stuffing all around the sides of the face and neck area. Shape as you stuff. It will take lots of stuffing. You will stuff more in a few more rows. For those of you who installed the strands of yarn with the eyes, hold the strands to the back of the head as you stuff but don't worry if they move around in there or even move to the front, mine did and it still worked out fine. Hang onto them though, you will need them at the end of row 25. *for those making the indents and cheeks, go back to the instruction page now and see step 2. *stuff more now. Be sure to get all around the bottom of the belly. The belly should be nice and fat. Stuff hand after 1 or 2 rows. Lightly stuff arm when you're done leaving the last 3 rows unstuffed. 15) fold top of arm flat and sc through both sides across. *stuff foot after 2 rows. At the end of row 15, stuff more into the foot, pushing stuffing into what will be the "heel" of the foot. If you want a kitty that sits then leave the last 3 rows of the legs unstuffed and then continue onto row 16. If you want a kitty that is in a permanent standing position, then stuff the entire leg and f/o now leaving a long tail for sewing. Please note: The white kitty has some pink in her tail. I did that by changing colors as I made the tail. I do not include those instructions. Feel free to play around with colors as you make the tail too! I have put the ASSEMBLY section on a separate page. Please click here for assembly instructions. This pattern is great! Do you ch1 at the beginning of each row? no, work in continuous rounds. Add a marker in the last stitch of row 2 then move that marker each time you end a row. Your patterns are delightful. Thank you so much for sharing your time, your talent and your creativity. Take care and God bless. 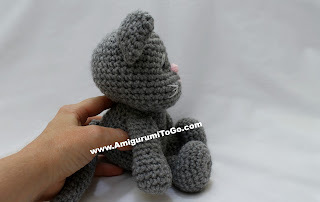 Hi Sharron, I'm a 14yr old "crocheter", n really wanted to make a cat, thx sooooooo much for this very useful pattern!